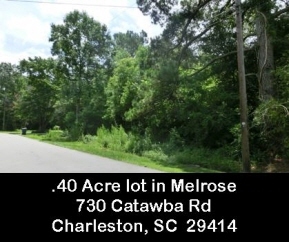 Large lot in established neighborhood of Melrose. Rare opportunity to build a home in established neighbor hood of Melrose. Located off of US Hwy 17 near I-526, Costco, fast food restaurants, Citadel Mall. Interior Features Large lot in established neighborhood of Melrose. Rare opportunity to build a home in established neigbhorhood of Melrose. Located off of US Hwy 17 near I-526, Costco, fast food restaurants, Citadel Mall.